Come and support your 2019 Grads! All proceeds support the activities of the graduating class of 2019. Baked goods will also be available to purchase during the Holiday Celebration on Wednesday, December 19th. 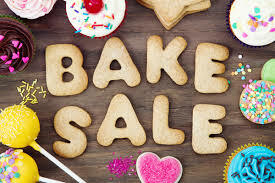 Contribute your baking talents and support our students! All classes will have the opportunity to purchase treats and parents are welcome to purchase as well (get ahead on your holiday baking – full cakes and other full baked goods will be available). Raffle prizes will also be available. We warmly welcome donated raffle prizes such as books, art materials, board games, Lego sets, small toys, and gift cards. A silent auction will be held on December 19th. We’re very grateful to our generous raffle and auction donors – the Concordia University (CIADI) 2019 Science and Engineering Summer Camp Award, the Trevor Williams Kids Foundation, Coop Collective Vision, Mouton Noir, Olives en folie, Kidlink, Appetite for Books, and Première Moisson Monkland – among others. Please contribute to this important fundraiser by bringing a contribution to school on December 18th. No time to bake? Purchased items are also much appreciated, as are gluten-free, dairy-free and egg-free treats (please label). Treats can be dropped off in the front lobby of the school. We will also need many volunteers throughout the day – please offer your time if you can. And don’t forget to send your kids with some pocket money on Tuesday, December 18th.